Not all stormwater management companies in Cleveland, OH are created equal. This is an important reality to keep in mind as you choose a firm to handle this aspect of your operations. Effective planning of stormwater management is essential to a site’s ability of protecting our waterway’s. This makes the right partnership with a stormwater management company crucial for property owners. To make the best choice, look for the following essential qualities of stormwater management companies in Cleveland, OH. Seamless services save time and money. A stormwater management company in Cleveland, OH that can provide comprehensive solutions delivers these savings. Offering solutions from start to finish, a full-service company provides everything you need for current operations as well as any services you may need in the future. Because it is difficult to know in the early stages of a project exactly what services you’ll require, a company that is proficient in all areas of stormwater management is ideal. They will provide a consistent partner to streamline your procedures, which will keep efficiency high and costs low. Permitting: The National Pollutant Discharge Elimination System (NPDES) permit is administered by the Ohio EPA for Construction and Industrial sites/operations. Property owners who wish to develop or use land must adhere to these standards by obtaining the proper NPDES permit.. Stormwater management companies in Cleveland, OH provide the preparation of the appropriate NPDES permit and develop the required Storm Water Pollution Prevention Plan (SWPPP) The company will also complete sampling and reporting to comply with regulations. SWPPP: The Storm Water Pollution Prevention Plans (SWPPP) is an essential piece of stormwater management and is required as part of the NPDES permit. The SWPPP will provide the strategy of how best management practices should be installed on the site to assist in reducing pollution sources form mixing with storm water and discharging off the site or facility. The stormwater management company will develop a thorough SWPPP that adheres to the NPDES permit as well as State and local requirements, as required and are largely prepared in accordance with Best Management Practices that are published in Technical resources. Details of the plan should include information on drainage areas and surrounding properties and an approach for managing storm water controls. It should also establish goals for reducing potential contaminants that could discharge from the subject property and pollute nearby tributaries. As the stormwater management company in Cleveland, OH develops the SWPP, technicians should complete property mapping, sampling, record keeping, and pollution prevention procedures. Cost reduction: When mismanaged, stormwater can generate burdensome costs that chip away at a company’s profits. Flood damage to land, structures, and inventory are common, as well as degradation to water quality of receiving waterways. Violation and in many cases, Fines for non-compliance to stormwater regulations is common for water quality damage. A partnership with a reliable stormwater management company in Cleveland, OH will eliminate these expenses. By putting the proper systems in place, the company will reduce risk and increase your bottom line. Local stormwater management companies in Cleveland, OH offer familiarity with the region’s regulatory bodies and their requirements. They possess key knowledge about the unique challenges and environmental conditions of the area. This insight can prove invaluable to developing effective stormwater management plans. As an additional bonus, the company’s proximity allows them to offer expedited services and in-person contact with their clients. To find stormwater companies in Cleveland, OH that are worthy of your business, look for those with a track record of success. Top companies use proven permitting, testing, and submission methods that result in high project approval rates. If the company doesn’t have a significant number of project approvals, look elsewhere. Don’t settle for less than the best. 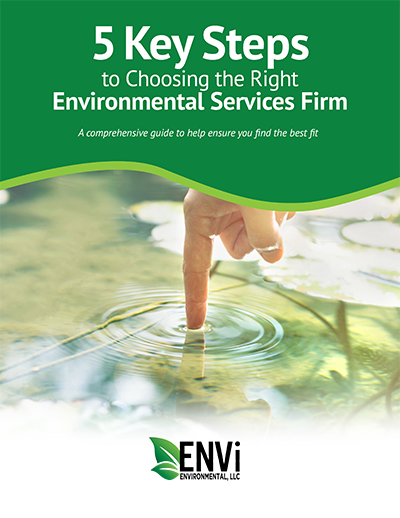 Comprehensive Solutions: ENVi Environmental’s complete suite of services, ENVi Seamless, includes all environmentally-related offerings. Our ENVi 360™ Solution covers the full spectrum of services for your projects. Local Experience: ENVi Environmental brings more than three decades of local experience to the table. We apply extensive knowledge of the regulatory requirements in Cleveland to every project. Positive Results: Our winning combination of experience and in-depth understanding of industry standards has resulted in a near-perfect record of successful approvals. Our consistent, detailed methods are key to our high approval rates and positive track record. Contact our team today to find out more about our stormwater management services and how they can benefit your business.